...if there were any jobs there and it didn't rain all the time. 6. 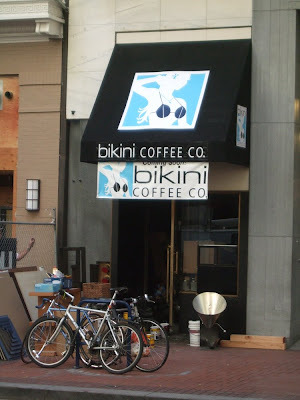 Bikini Coffee Co. -- Well, not really my thing, but I'm sure there's some people who would appreciate being served their lattes by a bikini-clad lass first thing in the morning on a cloudy day. 7. Mixology madness -- I actually didn't get to sample as much beer as I had planned because Portland is fully in the grip of cocktail fever. I met up with Chowhound poster and gastronome SauceSupreme, who's quite the cocktail fiend and we sampled some good stuff at Clyde Common. Bartender Justin mixed me up a Dequille (with bourbon, Chartreuse, grenadine and lemon), which was potent, refreshing and original, and the gastropub fare was also impressive. The tattooed barmaid in the photo above is at Teardrop Cocktail Lounge, where they mix up some really baroque and delicious concoctions with the arsenal of blue glass eyedroppers containing every type of herbal elixir. I got to try Austrian creme de lavender which was really cool, as well as a Love in the Afternoon with rye, muddled aprium and lemon basil soda. 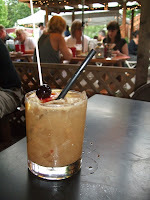 At the Whiskey Soda Lounge, which isn't just a bar but an ambitious Thai restaurant, I had the cocktail of my dreams: a Tamarind whiskey sour with tamarind, Buffalo Trace bourbon, lime juice and palm sugar. 8. Pok Pok/Whiskey Soda Lounge: Most everything is closed on Mondays in Portland, except the famous Thai snack shack Pok Pok and its adjoining restaurant Whiskey Soda. 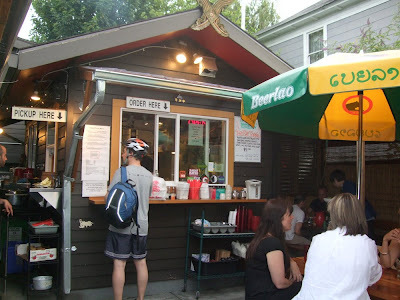 So there's a long wait for what might turn out to be a picnic table next to the takeout window, but no one seems to care, because this is Portland's best Thai food by all accounts. I'm not really used to eating Thai food in a non-Thai owned restaurant with no actual Thai people eating there, but with dishes like Muu Paa Kham Waan, boar collar meat grilled over charcoal with chili garlic lime sauce or Yam Samun Phrai, Northern Thai herbal salad with white turmeric, betel leaf, cashews, ground pork and Thai chilies, who cares who owns it. And not surprisingly, for a place called Whiskey Soda, the vast whiskey selection and cocktail menu are as good as the food. 9. Ken's Artisan Bakery: Apparently Ken also makes the best pizza in Portland at Ken's Artisan Pizza, but of course not on Mondays. 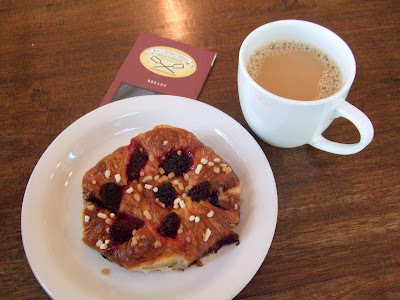 So I had breakfast at the bakery, with the flakiest, fruitiest possible Oregon blackberry croissant that could have made the Backdoor Bakery weep in shame. Caution: The bakery is full of very white people doing stuff white people like, like the yuppie dad who asked his toddler whether he would like to sing nursery rhymes in English or Japanese. 10. Small town flavor: The restaurant community in Portland must be quite closely-knit: At Clyde Common, I ran into Daniel from Beast, who amazingly remembered my name. At Whiskey Soda, I saw the server from Simpatica who had comped my breakfast the day before when they forgot me in a corner for a while. 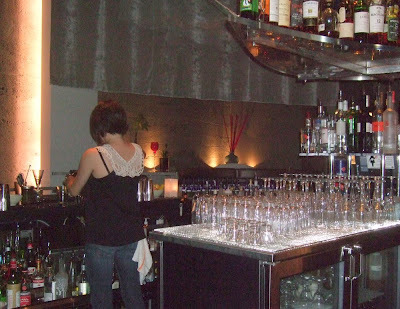 At Teardrop Lounge, I saw bartender Justin on a busman's holiday from Clyde Common. And at Beast, I met a lovely couple, Sean and Kristy, who gave me a ride back to my hotel down a long Twin Peaks-ish boulevard lined with strip clubs, trailer parks and a butcher shop that will dress your moose or elk. But I regret missing out on the bacon-maple bar at Voodoo Donuts, coffee from Ristretto Roasters and dinner at Lovely Hula Hands. I'm already planning a return trip to catch up on what I missed, and delve further into the beer scene. If you want to see some more of my Portland snapshots, they're on Flickr. Did you get a chance to check out Three Square when you were there? I hear so many good things about that place, and can hardly wait to try it myself. Interesting thing about Oregon and the mixology. Jeffrey Morgenthaler, one of the big names in cocktail blogging, is in Eugene. Portland and Seattle are good places to visit - take it from a former resident! Good mixologists are required to keep the suicides under control. I think anything, compared to the Backdoor Bakery would make them weep! 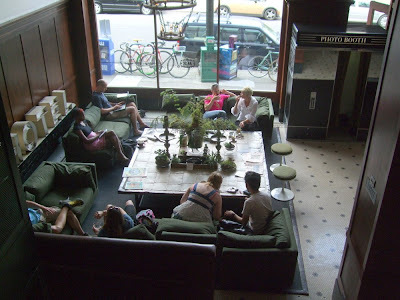 I got food poisoning there twice, from there chicken and chesse croissants they left sitting in direct sun in the glass cases with bacteria growing all day long. Portland is one of those cities I want to visit very soon. The Pacific Northwest in general seems to have an exciting food scene. Portland's population is 80% caucasian. Nothing against white folks as a whole, but, really, as bad as parts of LA are, the ethnic and cultural mix of the City of Angels (whites = less than 50% of the pop.) largely drives the food scene. Result? A better food scene. And Seattle? Not too long ago, I lived in Seattle for three years, near Green Lake. It took about six months to eat at every single worthwhile restaurant, cafe, diner, shop in the greater Emerald City area. Then I had to start repeating myself because there were no more good places to eat at. I could spend six months trying nothing but all the taco trucks in the greater LA area and still not repeat myself. 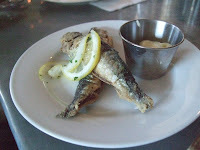 LA is crazy and insane and occasionally awful, but really, Portland is not a foodie's paradise. Seattle (whites = less than 70% of pop.) is much better than Portland for food.